The International Genetically Engineered Machine (iGEM) Foundation is dedicated to advancing synthetic biology education and collaboration within the scientific community. In 2012, iGEM spun out of MIT and became a non-profit organization based in Cambridge, MA. iGEM fosters scientific research and education by organizing competitions for students worldwide. Last weekend, the Giant Jamboree brought over 2500 students and researchers to Cambridge to compete in the largest synthetic biology competition in the world. 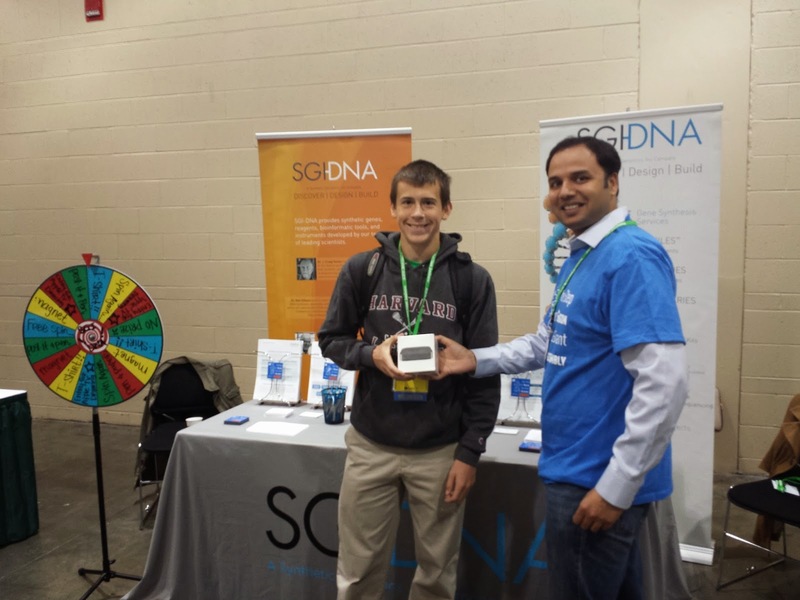 Spin the wheel to win SGI-DNA prizes. winners, he won an Apple TV! As a leader in synthetic biology, Synthetic Genomics works closely with iGEM to provide gold level sponsorship and biosecurity support. Using SGI's Archetype software, Toby Richardson screens iGEM's synthetic genes against regulated pathogenic sequences for every competition. These guidelines are implemented for every gene order submitted to SGI-DNA as well. As a member of the International Gene Synthesis Consortium (IGSC), we enforce strict international biosecurity guidelines for every gene synthesized, thus promoting the beneficial application of gene synthesis technology. SGI is also proud to sponsor the only UC San Diego team to compete in the Giant Jamboree this year. The UCSD team consisted of a variety of graduate and undergraduate students specializing in Bioinformatics, Cell & Molecular Biology, Bioengineering, Mathematics, Biochemistry, and Computer Science. The team developed a web tool called SBiDer: Synthetic Biocircuit Developer, that can bypass the months required to design, build and test a genetic circuit. SBiDer leverages existing devices to construct a database that can explore circuit designs. Users can search for a displayed circuit's literature reference, characterization data, and images through a powerful visual interface. It was impressive to see the creativity and applications behind each synthetic biology project at this year's Giant Jamboree. The accomplishments of these students are sure to lead to advancements in medicine, food & nutrition, environment, energy, software, and more. It was a great pleasure to meet and educate the next generation of synthetic biology scientists!